The numbers in the KGS table do not add up as you might expect. This is because they include points for wins against the inactive StoneGrid, and points for byes. Seven players entered. These included StoneGrid, which suffered from a problem and failed to make any moves. After six rounds I removed it, leaving the six players shown in the cross-table above. In round 1, StoneGrid and Orego12 played a reasonable game for 24 moves, then StoneGrid stopped moving, and lost on time. Its author John Fan later emailed me "Sorry the deadlock occurred again in StoneGrid. I think I found a suspicious spot. I will let it run on cgos for sometime to see if it is still occurring.". In rounds 1, 14, 22 and 28, pachi2 was White against Fuego, and the games all started with the same 16 moves, shown to the right. 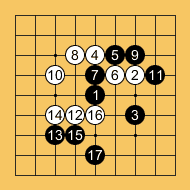 The sequence looks to me bad for White, who has lost two stones for no clear benefit. But White went on to win all four of these games, so I must be wrong. After move 17 the games diverged. Their continuations are shown to the left. In round 5, after StoneGrid had lost on time, I used my admin power to kick it from the server, in the hope that this might wake it up. In round 6 StoneGrid reappeared five minutes after being kicked (I have observed that this five-minute delay is standard, and is somehow a feature of the kgsGtp client). However it still did not make any move. So I removed it from the tournament after it had once more lost on time. 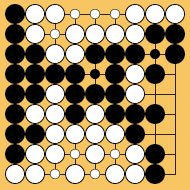 In round 9, pachi2 (White) and then Zen9 (Black) passed in the position shown to the right. They then failed to agree on the status of the two dead white stones, with Zen9 claiming that it could kill them and pachi2 claiming that they were alive. What should have happened now is for the game to enter the "clean-up phase": play resumes, and continues until there are two more consecutive passes, when all stones remaining on the board are counted as alive. What did happen is that the server announced the start of the clean-up phase, and told White to move. White passed. The server then stated "Cleanup mode has ended by passes. It will be assumed that all dead stones have already been removed. ", and never gave Black a chance to show that it could capture the two stones. The game was therefore counted as a 12-point win for White. It should have been scored as a jigo, or tie. The rest of the pairings were made by the KGS tournament scheduler in the belief that White had won this game, and in KGS's report on the tournament, the game is shown as a win for White and the SOS and SoDOS are calculated accordingly. 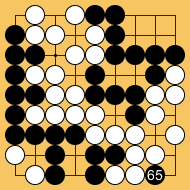 In this report, the game is shown as a jigo, thus WJ9, and the numbers of wins have been recalculated accordingly. I have not bothered to recalculate the SOS and SoDOS, as they are not needed to break any tie. The KGS progammer 'wms' has acknowledged the problem, and will fix it when he next can. In round 14, Fuego played move 65 as shown to the left. This move achieves nothing. 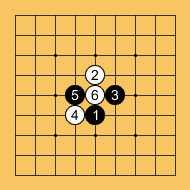 It went on to lose the game by resignation (when seven points behind) after its opponent, pachi2, converted its lower left territory to a seki. If instead it had played at 65 at a2 so as to make definite territory there, it would have won the game by two points. 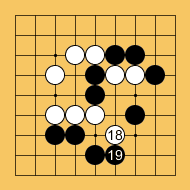 In round 19, oakfoam (White) and Orego12 started their game as shown to the right. Move 5 looks to me like a blunder, as it invites the very effective move 6. Indeed, oakfoam went on to win this game. The round 7 game between oakfoam and Orego12 had started with the same six moves, and was also won by oakfoam. In round 24, pachi2, as Black, was doing badly against Fuego. In the position shown to the left, it appears to have two options – resign, or hope to win the approach-ko in the top right. Instead, it connected the ko, as shown. By removing the ko, it made its position completely hopeless, in gote. But I can say that because I recognise that after capturing the six stones, White will have two eyes in the top right. My guess is that pachi2 was looking at sequences in which White captures, Black throws in, and White, by responding randomly, fails to make two eyes, and loses the whole group. In round 30, pachi2 and Zen9 both passed in a position in which pachi2 was two points ahead. 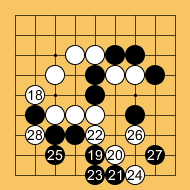 As in round 8, they then disgreed about the status of some dead stones; and as in round 8, Zen9 never had an opportunity to show that it could kill them, so the game was counted with them alive, giving pachi2 a win by 31 points instead of by two. This time the error made no difference, but it has been corrected in the cross-table above. 85 games were actually played (rather than being byes, or walkovers against an absent opponent) in this event, using komi of 7. 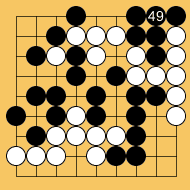 White won 47, Black won 34, and there were 4 jigoes.